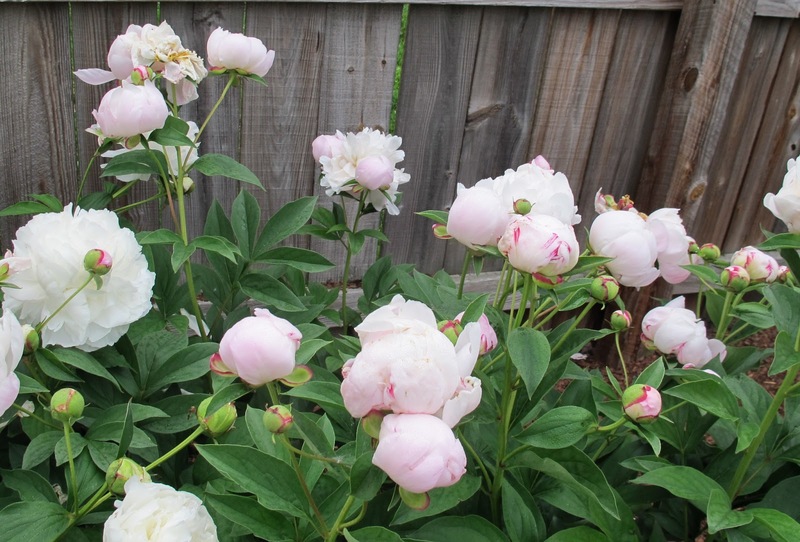 You may have your fancy peonies, your new varieties, even your tree peonies. I am sure they are very nice and give you joy when they flower. 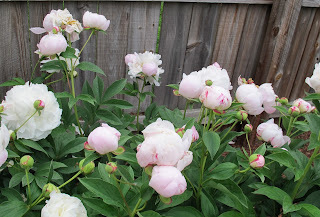 But for me, I only need the peonies that I got from my Dad's stand of peonies. They are like family. Good family, who don't need a lot of attention and return faithfully year after year and when they are here, they are no trouble at all. There are just a few tips, secrets, that you should know about them if you are going to invite them over to your garden. Enjoy the blooms. They are a delight in the spring. Deadhead when the blooms are spent. The plants will look much nicer without decaying blooms which turn all brown and mushy. However, if you want to leave a few spent blooms, you'll see that they have interesting looking seed pots. Feed them when they are done blooming. It takes a lot to produce such lovely blooms and so a little fertilizer afterward to encourage strong plant growth is welcomed by the plant. Dig and divide them in the fall. Fall is really the best time to dig them up, though I dug mine from my Dad's stand of peonies in early summer when they were threatened by some construction taking place at the time. I dug them up, potted them up, and then planted them out in late summer, as I recall. Plant just below the surface. Peony tubers like to be planted about two inches deep. Any deeper and they may not bloom in the spring. They also prefer a mostly sunny location but will grow in some partial shade. Cut the foliage back each fall and throw the remains in the trash. Peonies can suffer from botrytis blight which overwinters in old foliage. I cut mine back to ground level after a frost or two. Don't mind the black ants. Every peony I've every met will attract black ants before the flowers bloom. They do no harm. If you are going to bring peonies inside to enjoy as cut flowers, give them a good shake to knock off any ants that are hiding in the blooms. And finally, enjoy the blooms. Oh, did I mention that? It bears repeating. There's nothing quite like those big blooms when they visit your garden in the spring. oh yes i love peonies. i have one plant and i just love the smell. thank you for the info on how to take care of them. i am an amateur gardener for now..someday i hope to be a more professional one! Love them too although I only have one plant left in my gardens as they take up a lot of real estate for such a short bloom time. The plant I have left will always have a home in my gardens wherever I may be. It came from my husband's grandmother's garden thirty-six years ago. I've tried them so many times on different spots in the garden and taking in consideration all your tips, but they just won't grow and bloom here. I think maybe too much shadow and too wet in our garden...??? I love the many blooms in your picture! A completely trouble free plant. And one every gardener should have. Your guidelines are great but I'd add one other....don't just buy the old, tired Sarah Bernhardts etc, at Walmart or other Box Stores. Buy from a specialty nursery and get some old more rare, and some new ones. Buckeye Belle is a delicious deep red. Shirley Temple is a creamy delight. etc. Great post, Carol. Peonies were a part of my childhood and I was delighted to find established ones when I moved into this house 37 years ago. They've been faithful bloomers every year and I've divided and shared them with others. A word of caution to those buying new ones at the nursery - many of them have very little scent! Thank you for the tips. I gave my mother some this year and did not know much about them. Sadly, no peonies in my shady garden. But glad I got a chance to enjoy yours. I have one heirloom peony. Mrs. James Kelway. I love it!